In this dissertation it is argued that regressive harmony in some languages is exclusively unidirectional and independent of morphological restrictions. Primarily focussing on Assamese (with original research and data from the language), regressive harmony is shown to be the result of a precedence relation, where ‘marked’ sequences of vowels are prohibited. It is shown that regressive [ATR] harmony in Assamese, Pulaar and Karajá can be analysed with the aid of a higher, though violable constraint *[­ATR][+ATR]. Non iterative regressive harmony in Bengali and Tripura Bengali is also shown to require an analysis similar to that of Assamese, but the restricted domain of harmony require the constraint is *[­ATR][+high +ATR]. It is shown that locality, another important factor in harmony is apparent from the blocking of harmony by a nasal segment only in the immediate vicinity of the triggering segments /i/ and /u/. 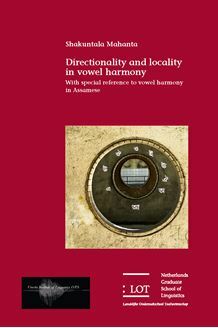 Locality is also evident in exceptional cases of vowel harmony. This dissertation shows that exclusively leftward vowel harmony in languages is inherently a directional process. Furthermore, there are various locality requirements in an apparently long distance process like vowel harmony and these have been explored in considerable detail in this dissertation. This dissertation is of relevance to theoretical phonologists, phoneticians as well as researchers interested in South Asian linguistics.